Paul Buchheit is a college teacher, an active member of US Uncut Chicago, founder and developer of social justice and educational websites (UsAgainstGreed.org, PayUpNow.org, RappingHistory.org), and the editor and main author of "American Wars: Illusions and Realities" (Clarity Press). He can be reached at paul@UsAgainstGreed.org. a Mylan product, in Sacramento, Calif., last month. For Mylan, it was a perfect plan - diabolical, unstoppable. 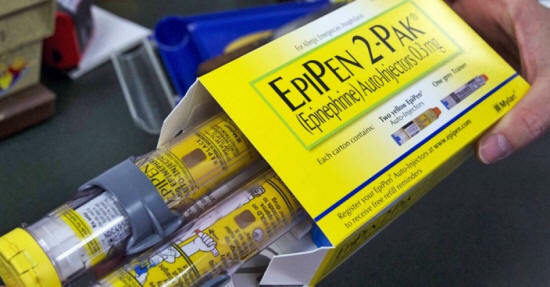 The company made changes in its anti-allergy EpiPen dispenser in 2009, enough to give it patent protection. Then, in 2012, it began to give away free pens to schools, gradually making school nurses at least partly dependent on them. Meanwhile the company was successfully lobbying for the "Emergency Epinephrine Act," commonly referred to as the "EpiPen Law," which encouraged the presence of epinephrine dispensers in schools. Most recently, after raising the price from $100 to $600, Mylan announced a half-price coupon, making itself appear generous even though the price had effectively jumped from $100 to $300. This is capitalism at its worst, a greedy and disdainful profit-over-people system that leaves millions of Americans sick... or dead. These are the sins of the pharmaceutical industry. The Mylan story is just one of many. An American with cancer will face bills up to $183,000 per year, even though it hasn't been established that the expensive treatments actually extend lives. A 12-week course of Sovaldi, for hepatitis, costs Gilead Sciences about $84 and is priced at $84,000. This is an industry that can suddenly impose a 60,000% increase on desperately ill people. Yet the pharmaceutical industry's profit margin is matched only by the unscrupulous financial industry for the highest corporate profit margin. "Somewhere, right now, a cash-strapped parent or budget-limited patient with a severe allergy will skip acquiring an EpiPen. And someday, they will need it in a life-threatening situation... and they won’t have it. "increasingly concentrated on the wealthy." As a result the richest 1% of American males live nearly 15 years longer than the poorest 1% (10 years for women). The high cost of medication is one of the factors leading to early death. We're paying twice for outrageously overpriced medications, both directly and with our tax dollars. The average medical insurance deductible has increased 67 percent since 2010, and most Medicare patients still face out-of-pocket costs of $7,000 or more a year. Over $5 billion of our tax dollars was spent by Medicare and Medicaid in 2014 on just two drugs (Sovaldi and Harvoni). Pharmaceutical lobbyists have rigged the system to prevent Medicare from negotiating for lower drug prices. Dean Baker notes that the U.S. is unique in giving drug companies patent monopolies on drugs that are essential for people’s health and lives. An example is genetically engineered insulin, which due to patent protection cannot be made generically, and as a result can cost a patient up to $5,000 a year, many times more than a patent-expired version. Another example is the anti-parasite drug Daraprim, which has been on the market for 62 years, yet was appropriated by the now-infamous Martin Shkreli and price-hiked from $13.50 to $750.00. A common excuse for pharmaceutical greed is the cost of research and development. But the industry spends almost $20 on marketing for every dollar spent on R&D. Meanwhile, Big Pharma has cut nearly 150,000 jobs since 2008, mostly in R&D. Other major drug companies use the notorious inversion procedure to skip out on taxes. Adding a further touch of hypocrisy, Mylan sought U.S. government help when another company tried to buy it out.